Nintendo's E3 was certainly a bit different this year, as rather than a laser-focus on the events of a live presentation, it had the feel of revolving around multiple video releases — starting with the E3 Direct. There were the developer videos, which gave some enjoyable insight, while the standard round tables and media presentations fleshed it all out; attendees, of course, got to enjoy hands-on time and the rather impressive booth area that Nintendo had developed. Nintendo's now produced a slick video that neatly summarises the various reveals, broadcasts and E3 venue events that took place over the last few days. We also get a better look at the various sets that have spawned plenty of fun pictures online. It's a neat summary of Nintendo's E3, and one that we feel successfully shows that it wasn't at all bad, even if some fan expectations weren't met; but that's always the case. Check it out below. Darn it, I am unable to watch it here and it won't be selected on the official Nintendo website. Noooooooo, Nintendo, tell me more about Super Smash bros. I like the games, i saw Nintendo went to a safe place for the competitors new console launches. The innovations are inside each game but i wished they show new material like updates, new IP´s like X or more things. Not only the same characters. The games looks great but Nintendo didn´t want to risk in new things in the consoles, maybe a video recorder with the Wii U gamepad or things like that. It was a truly great e3 for Nintendo fans. I will leave the other companies to discuss their products while I just play games and plan ahead to buy, well... all of the games shown above. They skipped over Bayonetta 2 extremely fast. That game seems to be the only one that pushes the Wii U's limits graphically. It even stands up to the best of what Xbox One and PS4 had to offer. Strange that most of Nintendo's first party offerings look more like up scaled Wii games than something truly next gen, considering that Platinum has shown it is capable of such. Overall, I was rather disappointed with this E3 from Nintendo. Mario looks evolutionary rather than revolutionary, I expected more from Retro, and Wind Waker denied the inclusion of the missing dungeon(s). I am excited for Smash Bros and Mario Kart 8 though. I have to say, I love Nintendo. Watching their executive team and developers show their enthusiasm, you can tell it's so genuine. In an E3 that was full of snake-oil salesmen and too-cool-for-school dude-bro games, it is so refreshing to see the "fun" is still very much alive in video gaming. Thank you Nintendo! Maybe my favorite E3 from Nintendo. It delivered what I hoped with the exception of MK coming next year but the game looks good so far. I loved Miyamoto at the end of the video. I started off really disappointed, but I slowly realized that this was actually a good E3. That was great fun.... just like all those games are gonna be. And isn't that what it's all about?! Good job Nintendo, lets all hope the Wii U will come good just like 3DS has. A successful Nintendo is good for us all! More Mario, Donkey Kong and Zelda remakes or sequels. Almost zero third party support. Its a little sad. Good for 8 year old kids. Best thing in this video is Jessie. Looks like E3 was a real blast. It seems like everybody was having fun. I know I will once these games hit the shelves. Hopefully 3D World and DKC: TF are enough to drive Wii U sales this holiday season and then MK 8 and the other early 2014 games keep the sales going. Then with a bigger install base we might just start seeing F-Zero, Star Fox, Metroid, etc. Nintendo let Platinum Games work on Star Fox or F-zero! "...I know the Pikmin did"
Hate to say it, but frankly, I'm a little underwhelmed this year. The only Nintendo game I'm really looking forward to is Smash Bros (for other consoles, it was Star Wars Battlefront). 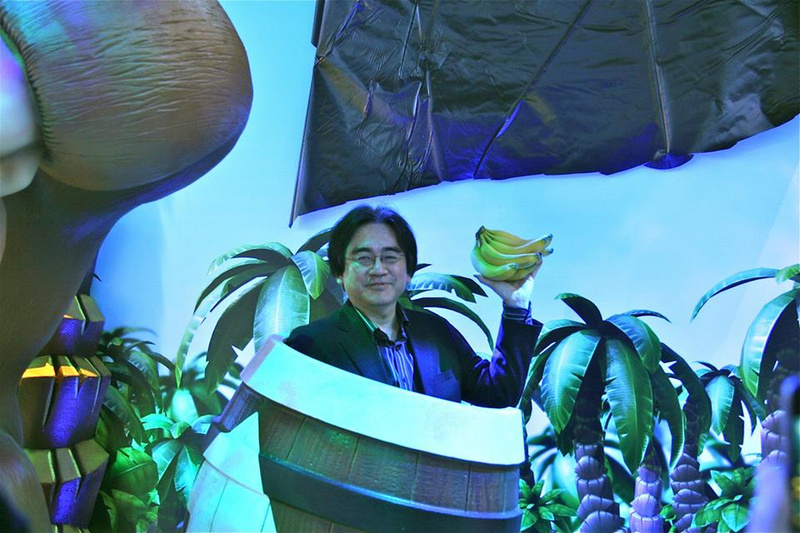 Is it strange that I find Iwata so fun and sweet? He seems like a genuinely nice guy. So humble. Nearly every video I see of him just brings a smile to my face. If this was a normal E3, and we didn't know the slate of games to be shown.... and then they revealed 3D World, Kart 8, DKC, Windwaker HD, and Smash Bros., people would have been flipping out and praising Nintendo. Strangely, that same mix of games is seen as disappointing since the only surprise was a sequel? This is why E3 means very little. So much bluster and then, months later, when the games are actually out, nobody remembers who "won" and the games are either fun or they're not. The more I see of this year's line-up, the better it looks. Nintendo has not disappointed me with their decision not to go to E3. Their direct videos have done an excellent job of getting me excited! Maybe (just maybe) the Direct was the right decision! It was relatively short, but it showed what mattered: Interesting games! No boring sales-figures, no awkward one-liners from Reggie (he was a former Sony man, keep that in mind). I rather hear Iwata talking how it is instead of Reggie! I only missed the live-reaction from a crowd! That's all! And I also liked the developer videos! And one last hint: We all know the Direct wasn't live, it never is! So why not posting it on any site, instead of live-streaming? Just a idea! Thank you for the streetpasses! Any chance you could send me a Pikachu 3ds XL? I can't find one anywhere? MORE STREETPASS PUZZLES PLEASE!! !